When my son turned 13 he finally got a cell phone. To mark the occasion we decided to make him a cake to match, perfect for this big teen milestone. 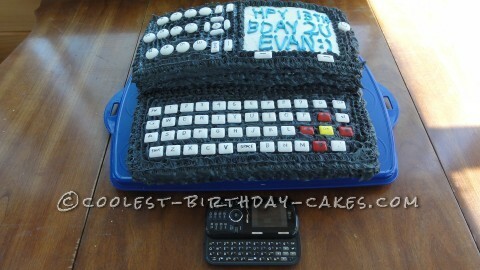 A cell phone cake could be easy, just a decorated 9×13, but we decided to go the extra mile and make the cake look just like his LG cosmos, complete with slide-out qwerty keyboard. I made two 9×13 cakes from mixes, and skimmed off the tops to make them flat. I cut about a 2″ strip from the long side of one cake and used it to extend the long side of the other one, then stacked the smaller cake on top of the larger for the slide-out effect. For frosting, I used two cans of butter cream tinted grey with black gel tint. I decided against fondant since my kids far prefer the taste of butter cream I piped the birthday message on the cake’s “screen” in “text speak.” We took a few liberties to make the keyboard and buttons stand out. After a lot of browsing through the candy aisles and experimentation, we used white Chiclets for the qwerty keyboard, accented with red and yellow ones, and wrote the letters very neatly on them with edible black marker. For the numeric keypad, we used white York mints, though white M&M,s would work, too, plus a few Tic Tacs. The effect was impressive! The cake was delicious. My son even stopped playing with his new phone long enough to eat a second piece and took pictures of his cell phone cake with his new phone!